"In those first few days, I couldn't sleep at all. I couldn't stop thinking about the tower and I couldn't stop thinking about the people in need." Chahine, who lives near Grenfell Tower in north Kensington, is one of a team of local volunteers working with the NHS to help residents struggling to deal with the psychological impact of the fire that killed at least 80 people. He has been visiting people who were affected and making sure they are aware of the services available to them. "I live in a tower too. It was like, 'that could have been me, that could have been my neighbours'," Chahine adds. "I think the mental health side of things is an issue that is going to last much longer than, say, the housing issue." Medical evidence suggests symptoms of serious post traumatic stress disorder (PTSD) often only surface four to six weeks after an incident. 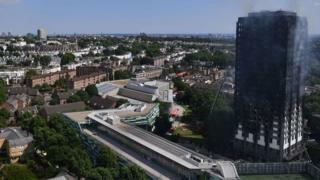 Three weeks on from the Grenfell Tower fire, local doctors report that many people are continuing to suffer "acute stress". "We're seeing lots of patients coming in who are now obviously displaced, living in hotels and B&Bs all around - and it's starting to have an effect on them now, in terms of anxiety symptoms, not being able to sleep at night," says local GP Dr Oisin Bannick, who co-ordinated the first response on the morning following the fire. "I've had patients in who wake up at night-time hearing the screaming from the building and it's very, very distressing for these patients." His colleague, Dr Ahmed Kazmi, who lost 11 patients in the fire, said that while 10-30% of the population were likely to develop PTSD after any similar event, the make-up of the local population put his patients at particular risk. "When you look at some of the factors for an event, that make PTSD more likely to arise from that, Grenfell has a lot of those factors - so, for example, man-made, involves children, lasted several hours, was unexpected - these are all features in an event that mean PTSD rates are likely to be higher." He suggested practical matters, such as rehousing, can also play a vital part in the recovery process. "Give these people suitable adequate permanent housing as soon as possible,," he tells BBC News. "It's going to be really difficult to expect to get well, engage in therapy, to start to try and heal, when something as fundamental as housing is still in the air." In the wake of the fire, and the recent terror attacks in London and Manchester, NHS England has sent out a letter to all GPs offering practical advice on how to help people affected by a traumatic event. People suffering ongoing panic attacks and flashbacks four weeks on are being advised to seek support from their doctor. "We must remember that for those people who were affected by these horrific tragedies, the journey is not over and many will continue to face difficulties," said Claire Murdoch, National Clinical Director for Mental Health. "We want everyone who has been affected to know that there is always support available and how and when they should access it. " And it is not only members of the public. NHS staff who worked during recent mass casualty emergencies, including Grenfell Tower and the London Bridge terror attack, also need help dealing with the aftermath of such tragedies. "People have been in shock up until now," says the Reverend Mia Hilborn, who leads the chaplaincy team at Guy's & St Thomas's NHS Foundation Trust. "There hasn't been time to find out if people do have any mental health issues. "We're still trying to process what happened - and to remember what happened, because your mind blanks things out. "People's memories are beginning to come back."